The Swiss Touring Club, founded in Geneva in 1896, is a non-profit organization at the service of roadside assistance. They offer a wide range of services covering all needs related to mobility and travel. The first www.tcs.ch website was established in 2000. Translated into three languages (French, German, Italian), its latest version includes more than 7000 pages. After the redesign of its website in 2005, TCS hoped to attract more motorists. « It was essential to improve our presence where the public seeks out the products and services we offer »said Yves-Alain Schwaar, Information & Web Services, TCS. Thus, in 2005, the company decided to develop a targeted ranking strategy allowing them to cover the demand of its most popular products. Identify online demand and the pathway used by internet users searching for TCS services to create an online strategy corresponding to the demand. Organic ranking process was accomplished by rebuilding the site. Also, certain errors, such as creating the title in flash, are avoided allowing the organic ranking process to limit the space it takes up on the site. Demand analysis is essential for an effective ranking. Carried out in the heart of search engines, it identifies the online demand by market while keeping track of variations between them. To obtain viable results, harvesting requires a little patience: a minimum of one month before ranking begins. That time limit gives the agency time to complete the templates for the new website in construction. In order to study the online demand specific per market, the foundation of all online marketing actions, TCS used an online IC-Agency's market research technology. 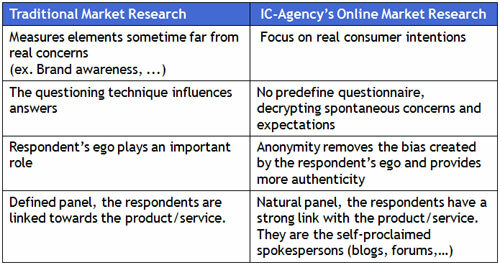 The table below explains the main advantages of this technology, compared to traditional market research. The technical aspects of the site are identified to avoid obstacles for a good ranking, like strategic parts of the website made with Flash, since Flash is not well indexed by search engines. Each page is attributed a specific title and descriptions containing keywords used by Internet users. Corrections have been brought to the text to optimize the number of occurrences of the most important keywords. Reporting conclusions bring new leads for a substantial optimization. The ranking process must be based on an analysis to correspond with demand to be effective: take out useless keywords that are not searched for by Internet users. Ranking must be considered at the same time as the site is being created. Why invest in a superb shop if it’s not placed on a street with traffic? Ranking constantly need to be updated: with competition being more aggressive, the efforts needed to remain in the top position continuously increase. 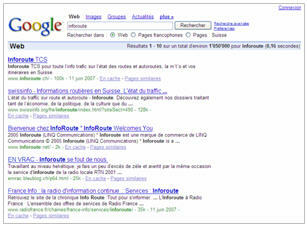 Search engines change their algorithms of page ranking which is why a regular update is needed.